For the first time ever, I agree with something Richard Stallman says. See here. In a nutshell, he says the cloud is all about taking away your freedom and locking you into long-term contracts that you can’t get out of and which will exploit you terribly, which is why Google and others are salivating over it. He’s hit the nail on the head. At long last, I.B.M. has issued software which will bring the e-mail, calendar and contacts functions handled by its Lotus Notes software over to the iPhone. Called iNotes Ultralite, the package will be free for anyone with a Lotus Notes license, and, as of last check, I.B.M. had moved about 140 million Lotus licenses. Lotus Notes remains popular among corporations. How Apple handles the substantial turbulence among consumers is, in fact, a major test of its strategy and momentum. When Apple publishes its third quarter results and–even more–its sales for the holiday season, we’ll see how its premium-priced product line holds up in tougher times. Will people still pay more for the style and ease of use of a Mac when they are worried about paying the mortgage and filling the tank in the minivan? Microsoft Unveils Next Version of Visual Studio and .NET Framework: Reveals extensive enhancements for simplified application life-cycle management, provides sneak peek at all key focus areas for Visual Studio 2010 and the .NET Framework 4.0. Apple Inc. shares fell 18% to their lowest point in more than 16 months, hit by growing concerns that the weakening economy might be finally catching up to the Silicon Valley icon. The company has been on a multiyear hot streak with hits such as the iPhone and its Macintosh computers. But two analysts downgraded their recommendations on Apple's shares Monday, questioning whether the company can continue to escape major fallout from slowing consumer spending. Japanese video game maker Nintendo Co Ltd plans to launch a new model of its DS handheld machine that can take pictures and play music by the end of the year, the Nikkei business daily said on Sunday. Forget the switches and routers that built Cisco Systems into a giant, albeit somewhat boring, company at the core of the Internet. These days, the company is peddling e-mail software, videoconferencing systems, cable-TV boxes — even furniture — as it tries to break out of the data center and get its products in front of ordinary office workers. "Cisco is kind of like the Madonna of networking," said Mark Sue, an analyst with RBC Capital Markets. "It is continuously trying to reinvent itself." The effort directly challenges a main area of growth for some of Cisco's big customers, including IBM, Oracle and most pointedly, Microsoft. Look who's #3 (behind Warren Buffett and Bill Gates), with a net worth of $27B, on the 2008 Forbes 400 (list of richest Americans). Database titan continues to buy up would-be competition; more than 40 acquisitions in the past 4 years. Bought BEA Systems for $8.5 billion in January. Revenues up 25% to $22.4 billion this year; profits up 29% to $5.5 billion. Stock down 12% in past 12 months. Invested $125 million in Web software outfit Netsuite; took public in December, stock promptly dropped 30%. His shares still worth $500 million. Chicago native studied physics at U. of Chicago, didn't graduate. Started Oracle in 1977. Public 1986, a day before Microsoft. Owns 453-foot Rising Sun; built a smaller leisure boat because superyacht is hard to park. Squabbling in court with Swiss boating billionaire Ernesto Bertarelli over terms of next America's Cup. Recently unveiled hulking 90-foot trimaran he intends to use to win it. A security hole in Adobe Systems software, used to distribute movies and TV shows over the Internet, is giving users free access to record and copy from Amazon.com's video streaming service. Speaking to analysts at a meeting in San Francisco, Ellison said that cloud computing, alongside industry trends including software as service and open source computing, were overhyped, ill-defined buzzwords, embraced by companies largely to market products and compared them to fashion trends in the women's clothing industry. In most cases, he said, these services aren't making money for their providers. "You won't see us opening any cloud centers, because the economics don't work," he said. "What the hell is cloud computing?" "Amazon has huge compute power and excess capacity. So it makes sense for them. But for us to go out and build a data center specifically to do this - it doesn't compute. "Who makes money in cloud computing?" Ellison also took aim at on-demand software, or software as a service, saying that like cloud-computing, many companies offering these services were struggling to drive profitability. "Back to the other great fashion - software as a service. Salesforce.com, which I was a founding investor in, barely makes any money at all. And they're a giant of the industry." Tangent on Salesforce.com: interesting that Marc Benioff was dumping 10,000 shares a day through mid-August (down from 20,000 shares/day last year); check this summary. Quite a contrast with Larry Ellison, who has held most of his Oracle stock since founding the company more than 30 years ago. Why is Google building a browser? A better question is, why did it take so long for Google to build a browser? After all, as Pichai says, "our entire business is people using a browser to access us and the Web." In a Computerworld report that summarizes recent Net Applications data, interest in Google Chrome has now died down to a standstill. Most of the people still downloading it are either night owls or from countries outside of the US, such as China, because the only activity is at night. As I mentioned in an earlier post, Chrome searches have now fallen in line with Firefox. This, after a week or hype and unforeseen interest made it seem like Google was going to a) take over the browser market b) usher in the end the OS as we know it and c) probably make Google really rich. Use Google search for everything. In the next decade, around 70% of the human population will have fixed or mobile access to the Internet at increasingly high speeds, up to gigabits per second. We can reliably expect that mobile devices will become a major component of the Internet, as will appliances and sensors of all kinds. Many of the things on the Internet, whether mobile or fixed, will know where they are, both geographically and logically. As you enter a hotel room, your mobile will be told its precise location including room number. When you turn your laptop on, it will learn this information as well--either from the mobile or from the room itself. It will be normal for devices, when activated, to discover what other devices are in the neighborhood, so your mobile will discover that it has a high resolution display available in what was once called a television set. If you wish, your mobile will remember where you have been and will keep track of RFID-labeled objects such as your briefcase, car keys and glasses. "Where are my glasses?" you will ask. "You were last within RFID reach of them while in the living room," your mobile or laptop will say. Platformonomics - MySQL or My Bad? The next question is what is the end game for Sun? Do they circle the drain like Silicon Graphics (yes, they are still in business) or do they get consumed by the likes of Fujitsu or perhaps a rising dynamo from the developing world? Leave your predictions as comments and maybe we'll start a pool. My $.02: HP and Oracle should acquire and dismantle Sun, with HP taking the hardware and services and Oracle taking Java and the rest of Sun's software business. If Senators John McCain and Barack Obama actually do debate Friday night, you will be able to watch what thousands of viewers think of their verbal sparring almost as they talk. Twitter, the service that lets techno-hipsters broadcast their thoughts in 140-character bursts, is setting up a special politics page to make it easy to tune into the chatter. The HP Oracle hardware partnership is definitely not happy news for Sun, and Sun's ~$1B decision to acquire MySQL AB is perhaps not looking so brilliant at this point. The major difference with this partnership involves Oracle’s decision to champion H.P. over its other close hardware partners like Sun and Dell. In the past, Oracle may very well have struck a deal like this with Sun, as Mr. Ellison has long counted Sun’s chairman, Scott McNealy, as both a personal friend and strong business ally. Times have changed, however with HP’s server business growing while Sun’s declines. In addition, Sun acquired MySQL, a maker of open source database software that competes with Oracle. For the Oracle/Dell partnership, I suspect it's only a matter of time -- as in the term of the HP exclusive in this context -- before Dell gets into the Oracle Exadata and Database Machine business. Given that Oracle has ~50% of the global DBMS market at this point, it'll be fascinating to see if IBM also jumps in, with Oracle-specific storage and server hardware. As with HP, Oracle has a multifaceted and bidirectional customer/supplier relationship with Amazon.com. Sun Microsystems Inc. Chief Executive Jonathan Schwartz received an $11.1 million pay package in the server and software maker's most recent fiscal year. The amount represents a 44 percent bump over the previous year's $7.7 million in compensation, a reward for Sun's recent profitability streak, but was far short of what Schwartz could have garnered. A serious downturn in the second half of the 2008 fiscal year, due to tougher competition from Hewlett-Packard Co. and IBM Corp. and Santa Clara-based Sun's heavy reliance on U.S. businesses and financial services firms, cut deeply into Sun's results and has held down its shares. The new platform, called APT, will allow both publishers and advertisers to manage display advertising across the Web sites of several hundred newspapers across the country, along with Yahoo sites and large sites like eBay and WebMD. At an event at Advertising Week in New York, executives said that the 800 or so members of Yahoo’s newspaper consortium would be using the system, formerly known as AMP, by the end of the year. I have often been perplexed, over the last ~25 years, by assorted waves of technologies and/or market positioning meant to suggest that the extended relational database management system market was somehow past its prime. I covered this general topic in a Burton Group Data Management Strategies blog post a few months ago, before I parted ways with Burton Group; skim that post for more details on the broader DBMS market reality check dimensions. While many people still believe that DBMSs are only useful for basic text and number data/application domains, and that open source DBMSs such as MySQL are "good enough" for a wide range of database management needs, in reality the leading commercial DBMSs -- which for Linux and Windows servers means mostly Oracle Database and Microsoft SQL Server, these days (with IBM DB2 in 3rd place) -- are expanding to address "the other 80%" of information that hasn't traditionally been managed in DBMSs, ranging from basic file management to elaborate XML documents and advanced, composite data types (e.g., for spatial application domains). And while some people assert that extended relational DBMSs are needlessly complex "bloatware", I think you'll find the people making that type of assertion are in many cases trying to sell you some type of self-proclaimed "next generation" specialized database system, and not being entirely objective about the DBMS incumbents. It's critically important to understand that the advances embodied in Oracle's Exadata and Database Machine announcements today apply to *all* information management domains, not just high-end data warehousing, and that overall information management market momentum is shifting more toward extended relational DBMSs than into any sort of specialized alternative model. The immediate market buzz will almost certainly be focused on the roles of Exadata and the Database Machine for high-end data warehouse scenarios, and the technologies do indeed have rather stark implications for incumbent and aspiring data warehouse specialists such as Teradata and Netezza, along with the storage vendors that have been most successful in data warehouse domains, such as EMC. Larry Ellison greatly enjoyed sharing price/performance data during his keynote session today, for example, data that will probably result in some major back-to-the-drawing-board initiatives throughout the data warehousing market landscape. The stakes are actually much broader than the data warehousing market, however, as Oracle's moves today represent a couple interesting attempts to exploit brute-force acceleration opportunities. First, by enhancing and modularizing Oracle Database (in 11g 11.1.0.7) so that some aspects of query processing can be handled in the storage tier rather than the database tier, Oracle has fundamentally changed data management price/performance equations. The Exadata storage model returns query results rather than data blocks, leveraging multicore Intel processors to deliver very smart storage subsystems. By combining the Exadata Storage model with Oracle Database clusters and InfiniBand networking in the HP Oracle Database Machine, Oracle is exploiting multi-level grid technology to radically accelerate DBMS performance, producing very disruptive price/performance attributes. Oracle's partnership with HP is another example of brute-force acceleration. From a software point of view, there actually isn't a lot of Oracle news today; the HP Oracle Database Machine is, in most respects, simply a very high-end packaging of capabilities that were already possible with Oracle's software (the storage tier-level query processing is new, however). Oracle RAC clusters and Oracle ASM (for automatic storage management) are mature, powerful, and widely-deployed technologies, for example, but the mainstream market may not have fully appreciated their implications until Oracle and HP partnered to create the HP Oracle Database Machine. This means, among other things, that existing Oracle Database applications can move to the new model with no modifications. Perhaps EMC and other vendors participating in the until-today business-as-usual data warehousing market would have eventually gotten around to delivering a similar model, but perhaps not -- i.e., it was probably up to Oracle to push for the architectural and business model acceleration, by partnering with HP over the last three years to create the products introduced today. So, is Oracle truly a hardware vendor now? Not really; HP has an exclusive partnership with Oracle (the duration of the exclusivity period wasn't announced today), and, while Oracle's sales force is responsible for selling the joint HP Oracle storage and database machine products, HP provides the boxes and the hardware support. I think it's safe to assume other traditional Oracle hardware partners will eventually also participate in the Exadata and Database Machine markets, but the timing is unclear. One thing that is clear, in any case: Oracle, with its Exadata and Database Machine offerings, just significantly accelerated its overall strategic agenda, and the moves will have ramifications that go far beyond the high-end data warehousing market. For some context-setting, before getting into the implications of Oracle's somewhat surprising entry into the hardware business today, it's useful to consider some ways in which Microsoft and Oracle have a lot in common. 1. Both companies appear to be relatively staid, when compared with edgier companies such as Apple and Google. Indeed, in many respects, in terms of the current market conventional wisdom, it often seems that Apple and Google can do nothing wrong, while Microsoft and Oracle can do few things right. Sure, Microsoft and Oracle are the largest pure-play independent software vendors in the world, and they're astounding profitable, but let's face it: they are usually portrayed as pretty boring big companies, in the mainstream press, and the press also seems to prefer to accentuate the negative where both vendors are concerned, e.g., problematic patches, threats from open source alternatives, senior executive departures, etc. 2. Microsoft and Oracle are both long-term-focused, with compelling -- and in many ways very similar -- visions about how information management can be productively transformed through the use of commodity-scale, end-to-end product portfolios, ranging from server operating systems to user environments for mobile devices. While again perhaps not as exhilarating or headline-worthy as the next cool web service from Google or iPhone from Apple, software from Microsoft and Oracle is driving a huge (and growing) percentage of global information systems today. 3. Microsoft and Oracle are at the center of expansive (and in many ways overlapping) hardware, software, and service provider ecosystems. While the press and blogosphere may sometimes leave people with the impression that traditional software vendors are obsolete, in favor of open source and smaller/focused alternatives (and now cloud/software-as-a-service stuff, of course), in reality Microsoft and Oracle both continue to be very strong market leaders, in terms of price/performance cost-effectiveness as well as feature/function innovation, especially when the pools of price-competitive developers and system administrators trained in their products are factored into the economic equations. 4. Microsoft and Oracle tend to formulate and stick to long-term plans. Microsoft is fundamentally a platform and tools vendor, with .NET at the center of its strategy, and Oracle -- as its name has always suggested -- is fundamentally about information management. Both have placed strategic bets on scale-out architectures for infrastructure, database management, application servers, and middleware. Indeed, with the exception of some important differences, such as the fact that the Microsoft Windows Server System is available exclusively on Windows Server, and Microsoft is focused on .NET, while Oracle supports multiple server operating systems and prefers the virtual machine architecture and application framework of the Java community to .NET, their architectures have a great deal in common. They also play well together, despite very aggressive marketing and sales organizations, because almost all large organizations use a mix of Microsoft and Oracle products (i.e., because their joint customers demand it). 5. Many people seriously underestimate the scope and momentum of the businesses of Microsoft and Oracle, in part because it sometimes takes several years and product releases before the vendors bring their visions to fruition. Oracle is an operating system vendor, for example, with its Enterprise Linux product, but you don't often read about that in the industry press. And Microsoft is actually a very strong global competitor in domains such as mobile device operating systems and game consoles, but the press usually presents Microsoft as a loser if it's not in first or second place in any market in which it seeks to compete. Both vendors keep pounding away at bringing their long-term visions to reality, in any case, and often, as two of the most resourceful players, also avail themselves of opportunities to advance their agendas through acquisitions. Overall, cool/hip or not, Microsoft and Oracle are both now exceptionally well-positioned to benefit from the disruptive changes percolating through the information technology landscape, including massively multicore computing clusters, radical changes in storage capacity and price/performance, and incredibly advanced networking technologies. Oracle made a very interesting leapfrog move today, with its Exadata storage server and Oracle Database Machine, but it's now playing a game in which, in many respects, it has only one kindred spirit competitor -- Microsoft -- and we can assume it won't be long before Microsoft (along with its partner ecosystem) unveils its response to today's Oracle news. I spent today in an invitation-only industry analyst day at Oracle OpenWorld, after spending the last two days attending OpenWorld sessions and exploring the seemingly infinite exhibit areas. One of the great things about being a software industry analyst is that you occasionally get invited to events such as OpenWorld, with breakout sessions such as the ones I attended today. The analyst day included several Oracle senior executives presenting business and strategy updates, a customer panel, and lots of opportunities for discussions, Q&A, etc. The scale of OpenWorld is amazing -- it's actually several conferences in one, due to Oracle's many acquisitions over the last few years. While there's definitely an overall database management system (DBMS) theme, given Oracle's database roots and business model, OpenWorld is also the customer/developer event for customers of acquired companies such as BEA, JD Edwards, PeopleSoft, and Siebel. I'm suffering from a serious case of information overload at the moment, but I'll try to capture, in the next few posts, some of the reasons why I think today, with some surprising news from Oracle, is going to be considered a major milestone in the database -- and overall enterprise software -- business. Oracle Corp., one of the best-known names in computer software, is entering the hardware business. The Redwood Shores, Calif., company Wednesday disclosed plans to sell a computer bundled with Oracle software, a combination designed to help businesses sort through data faster. The system, which Oracle describes as an appliance, will be manufactured for the company by Hewlett-Packard Co. and come with Oracle's database software already installed. Oracle will sell the system and provide support for it, said Charles Phillips, Oracle's co-president. Unless you're hopelessly dedicated to a landline-only existence, you're going to read a fair amount about the G1, a.k.a. 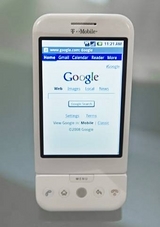 the Google Phone. Manufactured by HTC and offered by T-Mobile, the iPhone-like device runs on Google's Android operating system and goes on sale Oct. 22. But the biggest thing to bear in mind is that this phone was not primarily designed to solve a problem that you, the consumer, are having. Rather it was designed to solve a problem that Google has—namely, the need to keep feeding more and more people into the maw of Google's online advertising machine. Analysts said that the G1 did not represent the kind of revolutionary change in design and function that Apple introduced last year with the iPhone. But the G1 is likely to further accelerate two trends that will have a lasting impact on the wireless industry: the growing use of the Internet on the go, and the ability of consumers to customize their phones with their favorite functions. Android is unlikely to take the smartphone market by storm overnight. Despite its success, the iPhone accounted for just 2.8 percent of smartphones sold worldwide in the second quarter, according to Gartner, a market analysis firm. Windows Mobile, a seven-year-old Microsoft operating system that runs on phones sold by more than 160 carriers, has just 12 percent of the market. On a related complementor ... competitor continuum note, Cisco is more aggressively seeking to compete with IBM and Microsoft for unified communication/collaboration opportunities -- and Oracle as well, given Oracle's Beehive announcement this week. Cisco Systems Inc. made its name with devices that connect corporate computers. Now it is stepping up efforts to link people more productively. The Silicon Valley company Wednesday is expected to unveil a slew of products aimed at business users who want to collaborate on projects. The offerings include Cisco WebEx Connect, an online service designed to integrate tools such as instant messaging and Web conferencing with conventional business software and newer Internet applications such as blogs and wikis, which are collaborative Web sites. A cornerstone of Cisco's push into the collaboration market is WebEx Communications Inc., which the networking company acquired for $3.2 billion in 2007. The company has since acquired a handful of other companies aimed at adding more features to its collaboration offerings. Over the past month, Cisco acquired email-and-calendar start-up PostPath Inc. and Jabber Inc., an instant-messaging company whose founders helped develop technology used by Apple Inc.'s iChat and Google's Googletalk. As Cisco increases its emphasis on software, the company must build a reputation among corporate customers. Mike Gotta, an analyst with the Burton Group, a Midvale, Utah, market-research firm, estimates that it will take Cisco three to five years to establish itself in the market. "Cisco is a stranger to this space," said Mr. Gotta. "Right now, many corporate customers are saying, 'Who is Cisco and why trust them?' "
See the full article for more details, and this Google blog post for more positioning etc. The giant Internet search service yesterday joined with cellular carrier T-Mobile USA to unveil the first cellphone based on Google software. It's an aggressive bid to pry open the market for advanced wireless smartphones. Cole Brodman, chief technology officer for T-Mobile USA, noted only about 16 percent of Americans use their wireless phones to access the Internet. "We're going to change all that," he said. But the new phone, the G1 from Taiwan's HTC Corp., contains few breakthrough features and seems unlikely to challenge the popularity of rival smartphones like Apple Inc.'s iPhone. "I don't think that this phone itself is a groundbreaking thing," said Jane Zweig, chief executive of telecom research firm the Shosteck Group in Columbia, Md. While I expect the G1 may accelerate delivery of the rumored iPhone-with-keyboard, I still believe Google's strategy of directly competing with Apple, Blackberry, Symbian, and Windows Mobile may also backfire, leading mobile communications device and service provider players to reconsider Google's place on their complementor ... competitor continuum. After weeks of hype, T-Mobile’s G1 phone, which runs on Google’s mobile phone software Android, finally debuted Tuesday. But it immediately ran into a roadblock: the iPhone comparison. “Apple sets the bar pretty high,” chimed in Forrester Research analyst Charles Golvin. IPhone users fall into two camps, he said: tech enthusiasts who were already using wireless-data services on their cellphones, and more mainstream consumers who “had an awakening” when they began using the iPhone’s applications. Google’s new G1 phone announced today is the first real competitor to the iPhone. Like Apple’s product, it’s a serious handheld computer with a powerful new operating system (called Android) and a clever touch-based user interface. Like the iPhone, it’s likely to be a major new platform for third-party software. But it’s also very different, and may appeal to different buyers. In sum, the G1 is a powerful, versatile device which will offer users a real alternative in the new handheld computing category the iPhone has occupied alone. Somewhat paradoxically, Oracle has not yet made the OpenWorld presentation files available for download (and I didn't bring a camera to capture OpenWorld session demo images), so I can't include screen shots in this post -- that's unfortunate, in part because many of the screen shots reporters may run with in their Beehive-related articles this week are likely to be misleading, focusing on Beehive/Outlook integration rather than the broader and deeper Beehive capabilities available through the full/purpose-built and web-centric Beehive client. Terry Olkin also briefly displayed a super-detailed object model diagram (one I'm sure easily gets into the braincramp complexity range, when the various adapters and interfaces are included) -- the Beehive model appears to be very deep and intertwingled. Oracle has not published the underlying/corresponding Beehive database schema, but the developer-oriented object model is documented in the Beehive Application Developer's Guide. Several of the Beehive scenarios described at OpenWorld over the last couple days (in presentation sessions and in discussions at the Oracle Beehive stations in the cavernous OpenWorld exhibit halls) are similar to IBM Lotus Connections in some respects, e.g., attempting to exploit relationships among information items and people, not just basic capabilities such as document libraries and discussions. I definitely got the impression, over the last couple days, that the initial Beehive user experience is just the tip of the iceberg, in terms of fully leveraging the underlying conceptual model. 1. Oracle Beehive is likely to be popular with many Oracle-focused enterprises, especially those using one or more Oracle applications, as Beehive services will be integrated into future releases of Oracle's myriad enterprise application offerings (and are already included in a new Oracle Social CRM product). I doubt Beehive will broadly displace Outlook/Exchange and Notes/Domino for enterprise messaging in the immediate future, however (although it could become a competitive issue for Oracle customer organizations currently using Novell Groupwise, for example). 2. Oracle Beehive's DBMS-based infrastructure is, imho, a leading indicator of likely future communication/collaboration products from IBM, Microsoft, and other vendors. SharePoint is already SQL Server-based, of course, but its object model is not captured in SQL Server in a high-fidelity model mapping today (SharePoint treats SQL Server as more of a property bag manager, and SharePoint doesn't currently use any of the XML management services in SQL Server). Beehive doesn't fully exploit the native XML management capabilities in Oracle Database 11g, however, since Beehive is for relatively lightweight document management (and Oracle's Universal Content Management, designed for more complex content/record/etc. management scenarios, and based on Oracle's Stellent acquisition, also doesn't fully exploit Oracle Database in this context). 3. Beehive's wiki-centric model -- pervasively supporting "the wiki way", rather than treating wikis as a distinct workspace capability, is another useful example of beyond-the-basics hypertext support. Of course, it is not a foregone conclusion that Beehive will be broadly successful, as Oracle failed in at least three earlier attempts to compete in enterprise communication/collaboration domains, but success in these areas is in many ways a strategic imperative for Oracle at this point, and Beehive appears to have a very clean and integrated application model, so I'd be willing to bet $.07 it will be much more successful than OCS was (BTW I ran into Mike Gotta in the OpenWorld analyst room this morning and paid him $.07 for the OCS bet I lost, as explained in this post...). This post summarizes some of the details I've picked up about Oracle Beehive at Oracle OpenWorld this week. I'm frankly a bit surprised there hasn't been more of a buzz (that's the last bee-related reference for the rest of this post, I promise...) in the collaboration-focused parts of the press and blogosphere about Beehive over the last couple days, since Beehive represents what will become, if successful, the most significant enterprise communication/collaboration threat the current market leaders -- IBM and Microsoft -- have seen in many years. I'll share some speculation and projections in subsequent posts, and will keep this post focused on sharing some high-level Beehive details. Check this Oracle page if you want to explore official data sheets, product documentation, etc. Oracle WebCenter is an attempt to consolidate all of Oracle's many portal-related products into a single portal-centric framework and user interaction environment. Oracle Beehive is positioned as a collaboration services offering, but it also includes a variety of communication and coordination services. Oracle Universal Content Management started with the many products from Oracle's Stellent acquisition -- including, for example, web content management, records management, and information rights management. Beehive was developed by Oracle -- i.e., it is not based on acquired companies/products -- over the last 3 - 4 years (although at least a few services, e.g., the web conferencing parts, are apparently based on recycled/revised Oracle Collaboration Suite resources). It starts with an elaborate communication/collaboration/coordination-focused object model, building on Oracle Database for information management (database, content, files, etc.). Beehive supports many communication/collaboration/content-related (real and de facto) industry standards, and Oracle has also built plug-ins/adapters/etc. for popular enterprise clients such as Microsoft Outlook. The Outlook add-in is in some ways similar to the way Microsoft makes SharePoint document libraries accessible through Outlook, but all Beehive artifacts are managed in an underlying Oracle Database instance, optionally with Oracle's information rights management services. Beehive costs $120 per user, and it includes limited editions of Oracle Database and Oracle's BPEL-based workflow engine (and can also scale-up/out by fully leveraging Oracle's RAC etc., for enterprises that already have advanced Oracle deployments). It's a user-based licensing model; there is no separate price for the server elements. Current Oracle Collaboration Suite customers can upgrade OCS licenses to Beehive licenses at no charge. Beehive is available now for on-premises deployments, and Oracle also announced plans to make Beehive available as part of its Oracle On Demand (software-as-a-service) suite, but didn't specify availability or pricing details. International Business Machines Corp. will review its membership in the bodies that set common standards for the technology industry and may withdraw from some, potentially undermining the system that makes electronic equipment and software interoperable world-wide. The Armonk, N.Y.-based computer maker is expected to announce the review Tuesday, according to company officials. IBM has become frustrated by what it considers opaque processes and poor decision-making at some of the hundreds of bodies that set technical standards for everything from data-storage systems to programming languages, those officials said. A recent battle over the selection as an international standard of the file format used in Microsoft Corp.'s Office software suite appears to have influenced IBM's decision. Microsoft, of Redmond, Wash., won that contest in April when its Open XML format was approved by the Geneva-based International Organization for Standardization, or ISO. Meanwhile, I'm still at Oracle OpenWorld, where there will reportedly be a total of 1,830 presentation sessions this week. Of the ones I've seen so far -- obviously not a statistically significant sample size, but including the keynotes yesterday and today -- I haven't seen a single reference to OpenOffice.org or ODF (and sessions searches for "OpenOffice", "ODF", and "Open Document Format" return no results). All of the OpenWorld presentations I've seen have been in PowerPoint -- mostly PowerPoint 2007 -- and I've also seen several demos of Oracle products leveraging the Office 2007 add-in capabilities for contextual business intelligence, content management, and collaboration. Quite a contrast to IBM's strategy in this context. American cell phone users are sending more text messages than they are making phone calls, according to a Nielsen Mobile survey released Monday. For the second quarter of 2008, U.S. mobile subscribers sent and received on average 357 text messages per month, compared with making and receiving 204 phone calls a month, according to Nielsen. The new statistic is a clear indication that Americans have jumped onto the SMS text bandwagon. The surge in text messaging is being driven by teens 13 to 17 years old, who on average send and receive about 1,742 text messages a month. Teens also talk on the phone, but at a much lower rate, only making and receiving about 231 calls per month. The report even suggests that tweens or kids under the age of 12 are also heavy text users, averaging about 428 messages per month. The delay is a significant blow for the software maker, which has been counting on the next version of Windows Mobile to enable devices that better rival Apple's iPhone. Among the features widely expected to be part of the release is advanced gesture recognition, perhaps along the lines of the iPhone, but possibly also using the camera as a means for reading gestures. 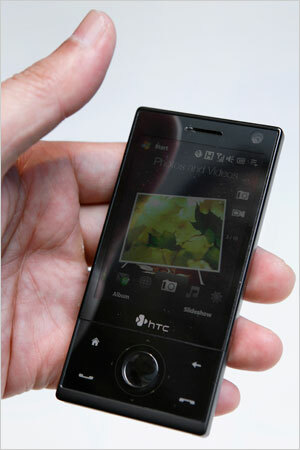 Microsoft's Tellme unit, which focuses on speech input, has also been working on Windows Mobile 7 features. I have to assume this is a hedge bet for HTC -- with ~infinite potential opportunity costs for its relationships with its current (direct -- device vendors) customers building smartphones based on other operating systems, this could backfire in a big way, especially since it's far from a foregone conclusion that Google Android is going to be broadly successful. A lot of Americans already use HTC phones — they just do not know it. HTC accounted for about one in six smartphones in the United States in the first half of this year, but the overwhelming majority of them do not carry the HTC brand, according to Nielsen Mobile. For much of the past decade, the company operated in relative obscurity as a contract manufacturer for companies like Compaq, Palm and many cellphone carriers, who stamped their own brands on the products. About two years ago, HTC decided to come out of the shadows with an ambitious goal: establish a global consumer electronics brand that its executives hope will become synonymous with quality. Cutting-edge technology is notoriously difficult to explain, but the term "cloud computing" has a whimsy about it that makes it instantly accessible. More importantly, the term makes one feel that it's OK not to fully understand the details: The computer processing takes place in this thing called the cloud, and as long as it works, no one really needs to know any more about what goes on there. With the term's meaning broadening, no one in the tech industry wanted to be left behind. These days it's hard to find a tech company that isn't pushing its own brand of cloud computing. Online software? That's cloud computing, as are services that let people store data on the Internet. Virtualization software that lets multiple applications run on a single server? That's cloud computing, too, because it makes leasing server space possible. Oracle Corp. on Monday announced a version of its database software for cloud computing. Dell Inc. recently tried to trademark the term because, the company argued, none of this would be possible without the servers it makes. So the term has become almost meaningless, though companies continue to use it. "We're in that nutty stage," says Billy Marshall, CEO of rPath Inc., which says it makes technology that enables, you guessed it, cloud computing. "It's absolutely too broad right now." It'll be fascinating to see if vendors relying on others' infrastructure, e.g., Oracle, offering some of its Oracle On Demand offerings on Amazon's cloud infrastructure, will be able to robustly compete with the global super-sized data center networks Google and Microsoft are building. Microsoft Corp. fired up its data "nerve center" in Westover Hills, Texas, on Monday. "With what's going on in the economy, it's great to be able to make a half-a-billion investment in San Antonio," said Debra Chrapaty, Microsoft's corporate vice president for Global Foundation Services. With this 470,000-squarefoot, $550 million data center, Microsoft competes directly against Internet giants such as Google. The powers of the Internet have strategically placed these massive server farms around the country to handle the world's growing need to move data electronically. This just in from the election information warfare and social networking front: apparently right-leaning organizers are trying to keep this PBS poll positive, so take a second (three clicks, starting here) and share your opinion. At the moment, it's 51% "yes", FYI. Do you think Sarah Palin is qualified to serve as Vice President of the United States? It appears I owe Mike Gotta $.07 -- when we were colleagues in Burton Group's Collaboration and Content Strategies (CCS) service (~2005 - 2007), I wrote a report in which I explained that I considered Oracle a strong contender in the enterprise collaboration market, poised for a strong #3 position behind IBM and Microsoft. Mike didn't agree, so we bet on it (my standard bet is $.07 -- kind of a long story...). My primary reason for asserting Oracle Collaboration Suite (OCS) was a contender was due to my sense that the enterprise communication/collaboration market was not optional for Oracle -- e.g., since every Microsoft SharePoint customer deploys SQL Server (on which SharePoint is built), and many IBM Lotus customers deploy WebSphere and DB2 in conjunction with Lotus products such as Quickr and Connections, being a non-starter in enterprise collaboration obviously had rather dire implications for Oracle's database management business, not just potential collaboration and content management opportunities. OCS was at least Oracle's third major attempt to compete in the enterprise collaboration market. The first major attempt I'm aware of, called Oracle Documents, if I remember correctly, was about to launch in 1994, when Oracle instead opted to enter into a short-lived strategic relationship with Lotus Development Corp. Oracle Documents got shot shortly before it was expected to launch, in favor of the Oracle/Lotus relationship -- Oracle placed a big bet on Notes instead. After IBM's hostile take-over of Lotus in mid-1995, Oracle took another run at the collaboration market with Oracle InterOffice, a product that didn't do well and was pulled from the market after a year or two. Oracle continued to offer some related products such as Oracle Mail, and a calendaring/scheduling product (based on its Steltor acquisition), but those products weren't prominent on the competitive radar for IBM or Microsoft. Oracle Collaboration Suite was the next broad attempt to compete in the enterprise collaboration market, and it was a very ambitious offering, representing an attempt to compete in enterprise messaging, async collaboration, and a variety of other communication/collaboration domains. It failed to put a dent in the universe, although Oracle asserted it had several successful customer case studies -- many of them in the price-sensitive government and education domains. I wrote a Burton Group report about enterprise collaboration a few years ago, projecting that Oracle had a shot with OCS -- and certainly a competitive imperative -- to successfully compete with IBM and Microsoft in enterprise communication/collaboration. Mike Gotta disagreed, but I was the CCS research director at the time, and I went ahead with the report. I was right about the Oracle competitive imperative part, but I was wrong about OCS; the product was quietly retired today today, replaced by Oracle Beehive, which I'll describe in another post. Tangent: I am no longer a Burton Group employee -- it had nothing to do with my assorted debates with Mike Gotta (which I've always enjoyed, and from which I always learn a lot), nor did it have anything to do with the controversial ODF/Open XML report I published earlier in 2008 (which, in hindsight, already seems almost quaintly conservative, although it caused quite a blogosphere/etc. storm at the time). It was simply time for me to move on, after a very productive ~five-year run at Burton Group, and I'm now an independent software industry analyst/consultant, focusing on collaboration and information architecture topics. If you'd like more info on that transition, please contact me as pbokelly [at] okellyinc [dot] com. I'm at my first Oracle OpenWorld since 1994 this week. Today was the first day, and I'll share some impressions in this and subsequent posts. There are 43,000 people here for the event, and a total of 1,830 sessions (I think I ran into most of the other attendees tonight at a reception event that offered -- but not for long -- free food). Oracle has 85,000 employees; of those, 20,000 are developers, and one-third came from acquired companies (50 companies acquired during the last five years, for ~$34B). Oracle invested $3B in R&D during its most recent fiscal year. The company has ~3,000 products. The only other OpenWorld event I've attended, ~14 years ago, included a last-minute surprise closing keynote, during which Oracle and Lotus Development Corp. unveiled a strategic partnership -- Oracle explained that Lotus was its strategic groupware partner, and Lotus made a strategic commitment to Oracle as its preferred DBMS partner. I was on-stage for the closing keynote, working as a Notes product manager at the time, co-presenting a series of demos of how Lotus Notes and Oracle products could be productively used together. That's all ancient history now, as the Lotus/Oracle strategic relationship ended abruptly when IBM completed its hostile acquisition of Lotus less than a year later, but it was a fun week, and in many ways, as I'll explain in a separate post, Oracle is only now finally getting its collaboration act together. Data modeling is integral to the success of Microsoft, making sure that the company has a good picture of customer activity and needs across business units. One challenge in keeping good data on customers -- data degrades, Briggs said. People get married and change their names, companies move and they get acquired. Briggs quoted the Greek philosopher Heraclitus: "You cannot step in the same river twice." But one member of the audience, who described himself as "Cranky Guy," was startled by Briggs's description of data modeling being at the core of Microsoft's business. "My CIO would slap me in the head if I said that," Cranky Guy said. What about channel relationships, sales, or talking to customers? Briggs said that those things, and more, are important -- but data modeling is at the foundation of those things, because companies need a thorough understanding of their customers to accomplish those things. Fifteen years ago, only the big retailers could afford intelligent cash registers that tracked inventory and produced detailed daily reports. Nowadays cash registers are just PCs with a different user interface, and the smallest mom and pop retailer can track sales and inventory on a daily basis. A decade ago, only the big multinational corporations could afford systems to allow for international calling, videoconferencing, and document sharing. Now startups with a handful of people can use voice over IP, video, wikis and Google Docs to share information. These technological advances have led to the rise of "micro multinationals" which can leverage creativity and talent across the globe. Even tiny companies can now have a worldwide reach. These changes will have a profound effect on the global economy. According to the U.S. Small Business Administration, "small businesses represent 99.7 percent of all firms, they create more than half of the private nonfarm gross domestic product, and they create 60 to 80 percent of the net new jobs." Information technology has already had a huge effect on the productivity of large businesses, but the benefits from "trickle down productivity" may be even more significant. Randall Stross, a journalist at the New York Times, does a good job of analysing this unbounded ambition by organising Google’s quest into its thematic components. One chapter is about the prodigious data centres that Google is building with a view to storing all that information, another about the algorithms at the heart of its web search and advertising technology, another about its approach to dead-tree information bound in books, its vision for geographical information and so forth. He is at his best when explaining how Google’s mission casually but lethally smashes into long-existing institutions such as, say, copyright law or privacy norms. GOOGLE controls about 70 percent of the search advertising market. Doesn’t that give it a monopolist’s ability to set prices as high as it wishes? It does not. Google does not set the prices. Its advertisers do, bidding against one another for the amount they will pay when a user clicks on one of their ads. They do the same for ads on Yahoo and Microsoft search sites, too. Earlier this month, the Financial Times reported that PTC had hired Goldman Sachs to explore selling the 23-year-old company, seeking a price of more than $2 billion. The company isn't commenting, but some see the potential sale as the end of the road for a company that helped develop the market for what is called MCAD, or mechanical computer-aided design software. "They have no future," said Mike Payne, an engineer and executive who was PTC's third employee. Since leaving PTC more than a decade ago, Payne has focused on starting companies that have sought to democratize MCAD software, making it less complicated and less expensive. VMware said Friday a senior executive in charge of product development at the software maker, is leaving, the latest in a recent string of executive departures there. Spokeswoman Mary Ann Gallo said that Vice President of Product Development Paul Chan resigned in August, after seven years with the company, and will leave Oct. 3. VMware's stock price, one of last year's top tech performers, has lost about two-thirds in value this year as two of its founders and its top executive in charge of research and development have left the company. Mr. Brin declined to be interviewed. But my colleague Allen Salkin had some insights into one of Mr. Brin’s possible motives. Allen chatted with Mr. Brin at a New York party on Sept. 9 to promote 23andMe, the DNA-testing company of which Mr. Brin’s wife, Anne Wojcicki, is a co-founder. During their conversation, Mr. Brin said it could be useful to have one’s DNA code open to the public, where it could follow a sort of open-source model. If his data was public, he said, doctors — or anyone who was interested — could look at his results and make suggestions about how he should handle them, offering treatment suggestions if it showed he might be susceptible to a disease. On top of the usual launch and landing dangers, the Atlantis crew faces an estimated 1-in-185 chance that a piece of space junk or a micrometeoroid will cause catastrophic damage to their ship. Those are greater odds than for a typical shuttle flight because of Hubble's extremely high and debris-littered orbit. Before reaching Hubble and again after leaving it, the Atlantis astronauts will inspect their spacecraft for signs of damage, just as crews always do while in orbit. The San Jose, Calif., computer networking company is betting that business users will want the tools it is acquiring to work on, share and store files in a virtual "work room," where they can collaborate on projects and communicate over the Internet. Cisco believes such tools, dubbed the "collaboration" market, can be a $34 billion industry. Other players in the market are Microsoft Corp. and International Business Machines Corp.
"Make no mistake, we are playing to win in the [collaboration space]," said John Chambers, Cisco's chief executive and chairman during the company's analyst day Tuesday. "The events of the last few days have made it clear that we must take further bold and decisive action to shore up confidence in our financial markets and avoid a deepening economic crisis that could jeopardize the life savings and well-being of millions of Americans," Obama said in a statement. "He chose the wrong scapegoat," said James Cox, a professor of corporate and securities law at Duke University who is not related to the SEC chairman. "It shows a profound ignorance of something (McCain) ought to know about being in Washington, and that is the limited regulatory authority of the SEC." Cisco increases its bet on communication/collaboration -- while this was probably a small deal relative to Cisco acquisition norms, it's going to have significant ramifications for the IM and presence awareness markets. In a sign that open source has truly gone mainstream, Cisco Systems forgot to mention that Jabber is an open-source messaging company when it announced the acquisition of Jabber on Friday. Indeed, the real news centers around Cisco's growing battle with Microsoft over collaboration, as Larry Dignan points out over at ZDNet. Open source? That's just necessary plumbing, apparently. Indeed, even Jabber hardly mentions open source throughout its Web site, preferring instead to focus on "open standards." See this Cisco press release for more details. vowe dot net :: What do you think Lotus will be doing? What do you think, Lotus can really do if they try? Or what do you think they will do? Lotus will not make Domino their primary development platform for new application. I have a couple of reasons to believe that. Go to the research lab at Lotusphere and see how these guys build stuff. And then look at the software development in IBM Software Group. Lifecycle management, development tools, etc. Lotus will not greatly simplify to a few products. Why? Because some things cannot be thrown in because they are owned by more than one brand. Those products have to stand on their own. Or on more general terms: every product has to stand on their own. What is Notes' core strength? What is Notes' core weakness? Google accounted for 63 percent of searches by U.S. surfers in August, up from 61.9 percent in July and 56.5 percent in August last year. The increase came at the expense of the second- and third-largest players in the market, Yahoo Inc. and Microsoft Corp.
Yahoo's share fell to 19.6 percent from 20.5 percent in July and 23.3 percent a year ago. Microsoft's share was 8.3 percent, down from 8.9 percent in July and 11.3 percent a year ago. Current Amazon customers can accomplish much the same via the existing Simple Storage Service or S3. The new service, Amazon says, will make it easier for customers to distribute their files to a diverse set of data centers, improving performance. Like most Web account services, Yahoo Mail provides an option to reset or recover one's user name and password. What is unclear is how the account recovery was rerouted from the alternative e-mail address chosen by Palin to a secondary e-mail address. When Yahoo Mail prompted for Palin's birthday, one poster said it took only 15 seconds on Wikipedia to answer that question. When it prompted for ZIP code, Wasilla, Ala., has only two ZIP Codes. As for Palin's personal security question "Where did you meet your spouse?" that did slow the process down. The poster claimed it took several tries but eventually hit upon the correct answer: Wasilla High. Its “jump the shark” moment seems to have been its deal with Yahoo. The database and business software maker reported first-quarter revenue rose 18 percent to $5.3 billion, compared with $4.53 billion in the quarter a year ago. The sale of new software licenses, a closely watched measure, rose 14 percent, and revenue from software license updates and product support was $2.94 billion, an increase of 23 percent. Larry Ellison, the chief executive, focused on the company’s market share gains. “Oracle’s 49 percent market share in the survey year 2007 was greater than the market share of the next four vendors combined: I.B.M., Microsoft, Teradata and Sybase,” he said in a statement. I continue to be very impressed with the Obama campaign's use of information technology -- and its policies/platform, of course. Check out the latest economy video. The economy hit a new low this week, and people are feeling it in every corner of the country. Meanwhile, John McCain is offering nothing but distractions and distortions. Watch this video and help get the conversation back on track. The RAC Foundation found average reaction times slowed by 35% when 17 to 24-year-olds drove in a simulator while writing or reading texts. Nearly 50% of drivers aged between 18 and 24 texted while driving, it said. Previous studies had found reactions were 21% slower among those who had taken cannabis and 12% slower among those who had drunk to the legal limit. Social networks might be popular, but the industry is struggling to find a way to turn all those users into a big payday. This conundrum is the focus of industry executives gathered at the Social Ad Summit in New York this week, and while no company has yet found the perfect solution, advertising campaigns that make far better use of social-network functionality are starting to offer hope of richer returns. According to Michael Lazerow, founder of social-advertising company Buddy Media, 37 percent of adult Internet users (and 70 percent of teens) in the United States use social-networking sites regularly. Meanwhile, less than 1 percent of all digital-advertising budgets currently flows to social-media sites. Cisco Systems has found a way around all that bothersome metal and plastic used to make its networking gear. The company has concocted a virtual switch that it’s selling in tandem with VMware, the leader in virtualization software and a close Cisco partner. The Cisco Nexus 1000V is a curious device because it’s not a device at all. Instead, the virtual switch, due to ship in the first half of next year, uses software to handle many of the networking and security functions found in Cisco’s standard hardware. The campaign, which begins Thursday and carries the theme “Windows. Life without walls,” will move away from the enigmatic teaser commercials that featured Bill Gates and Jerry Seinfeld in offbeat conversations about shopping, shoes, suburbia and the potential of computing to improve life. The teaser ads have generated considerable discussion since they started on Sept. 4, not all of it positive. IBM Corp. is setting up a research center in Cambridge to develop better ways for businesses to use social networking software. "It's something that can have worldwide impact," said Irene Greif, director of IBM's new Center for Social Software. The move represents a further commitment by IBM to invest in Massachusetts, where the company already employs about 5,000 workers. An IBM spokeswoman said the company will probably hire additional workers to staff the center, but did not say how many jobs might be created. I guess she should know, since HP's board concluded the same thing about her. Meanwhile, on the "Al Gore invented the Internet" theme and the bizarre "joke" about McCain inventing the Blackberry, check out this Wikipedia article to learn about Gore's numerous and substantive contributions to the development of the commercial Internet. The residual controversy in this context is a timely reminder of how deeply damaging the culture of cynical slime fostered by Karl Rove et al can become.